*HIDDEN GEM* Offering amazing potential, this fabulous detached bungalow is accessed via a private driveway and set within 1/3 acre of private gardens in the ever popular semi rural village of Silkstone Common. 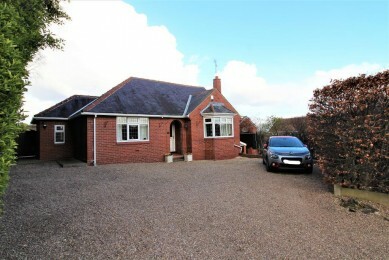 The property is a hidden gem and must be viewed to appreciate the privacy and potential on offer. Whether you are looking for a lovely big garden or in need of a property project with room to extend, this could be the house for you. Call today! Benefiting from a porch giving cover to the entrance, a uPVC glazed door opens into the hallway which gives access to the living room, all three bedrooms and the family bathroom. A welcoming and tastefully appointed open plan reception room which is filled with light from the large front facing bay window and further side windows. The room boasts neutral decor and carpet plus wall-hung electric, flame effect fire and provides very versatile open plan space which currently incorporates the dining area. Providing ample space for a family dining table and situated adjacent to the kitchen, within the Lounge with a double glazed window and complementary blind. Fitted with a matching range of wall and base units with an expanse of worktop space over incorporating a drainer sink unit with contemporary swan neck mixer tap over. Further boasting integrated appliances including AEG fridge and freezer, oven, electric hob and dishwasher, plus space and plumbing for a washing machine. The kitchen further benefits from complimentary splash back tiling and full tiling to the floor, a handy storage cupboard, radiator plus lovely views of the gardens. A uPVC door gives access to the garden area. A further well presented and appointed single bedroom featuring neutral decor and carpet plus a double glazed window providing lovely views of the gardens. A spacious and well presented master bedroom featuring mirrored sliding wardrobes, neutral carpet and decor and further benefits from a large double glazed window overlooking the front of the property. A large second bedroom featuring windows to both the rear and front providing both front and garden views. The room is tastefully appointed in neutral colours and benefits from solid wood flooring. Fitted with a white three piece suite comprising a low flush WC, pedestal wash hand basin and bath with chrome shower over and complimentary screen. The room boasts fully tiled walls and modern oak effect laminate to the floor. There are down-lights to the ceiling, a central heating radiator and large double glazed window with obscure glazing. The property is accessed via a shared driveway off Viewlands (which is to be re-surfaced) which in turn leads to a private block paved driveway, giving access to the front of the property and the large parking area. To one side of the property, housed in an outbuilding is the Oil heating boiler and tank, which provides heating and hot water to the property. Set privately behind mature trees, the property boasts an extremely large garden mainly laid to lawn with outbuildings and a shed. There is a lovely decking area ideal for al fresco entertaining whilst the garden provides an amazing space for children to play. Details of all the properties currently on offer through Gates Estates can be viewed on gatesestates.co.uk or by using the search feature within Rightmove. If you wish to make an offer on this property before contacting a Financial Advisor or Solicitor you should make your offer to our office to avoid any delay and the possibility of a sale being agreed to other interested parties. Under the Estate Agents act 1991 you will be required to give us your financial details to enable us to qualify your ability to purchase before we can recommend your offer to our sellers. Offers may be made by visiting our Birdwell Office or by telephone or email. In order to proceed with a sale we will need confirmation of Identity and Proof of address. If you have a property to sell our Company Director and Valuer, Ryan Gates will be pleased to arrange an appointment to give you a market valuation and advice. The advisory service is free and without obligation. These particulars do not constitute any part of an offer or contract. All statements contained in these particulars are given in good faith but are made without responsibility on the part of Gates Estates or the vendors or lessors. Any intending purchaser or lessee must satisfy themselves by inspection or by taking advise as to the correctness of each of the statements contained in these Particulars. All prices quoted are exclusive of VAT, unless otherwise stated. All measurements, areas and distances quoted are approximate only. Information provided in respect of planning and rating matters has, unless stated, been obtained by way of verbal enquiry only. Interested parties are therefore recommended to seek their own independent verification on such matters from the appropriate Local Authority. Location and site plans if provided, are for identification and directional purposes only. The area surrounding the subject property may have changed since the plan was produced. Gates Estates have not tested any apparatus, equipment fittings or services and so cannot verify they are in working order. Prospective purchasers are advised to obtain verification on such matters via their surveyor or solicitor. The boundaries, ownership and tenure of this property have not been checked against the Title Deeds for any discrepancies or rights of way, if any. Prospective purchasers are advised to check these matters with their solicitor prior to entering into any contracts. Gates Estates have links with leading mortgage providers who can find the best mortgage product for you.